I can relate to the creative process behind Birthmarked since most of my ideas also work out fine in my head. It’s when I start realizing them that I run into problems, lots of them, and that’s what seems to have happened here. The film, directed by Emmanuel Hoss-Desmarais from a script by Marc Tulin, takes on the nature vs. nurture debate and is about two scientist parents who engage in a highly unethical experiment with their own children as subjects. They hope to settle the question of whether a person is shaped primarily by biology or by environment, but really they also wouldn’t mind the prestige and bottomless funding. The story, which begins in the late 1970s, is ripe with possibility. Ben Morin (Matthew Goode) and Catherine O’Neal (Toni Collette) both come from families of celebrated scientists, and when she becomes pregnant with their first child, they decide to embark on an experiment that will shape their lives for the next ten years or so. They hypothesize that a child can be brought up so as to overcome his or her background, which is why they end up adopting Maya (Megan O’Kelly), who descends from “a long line of dim-witted individuals,” and Maurice (Anton Gillis-Adelman), whose family is prone to criminal violence. The couple set off to an isolated house in the woods, lab rat babies in tow, where they expect to raise Maya to be a genius, Maurice to be a pacifist, and their biological son, Luke (Jordan Poole), to be an artist. You can guess that things don’t go according to plan and in fact progress terribly by decade’s end, even with the help of oddball Russian assistant and former Olympic sharpshooter, Samsonov (Andreas Apergis). Ben and Catherine find that they could be beaten to the punch by Portuguese scientists who are conducting a similar experiment. Their financial backer, a wealthy Terry Richardson-looking guy (Michael Smiley) whose thing is rebel science, threatens to make them repay the entire cost of the project if they don’t get the results they expected. Worst of all, after rounds of testing, their children appear to be nothing more than average, socially well-adjusted kids! I suspect what is at the heart of the film is not a question of nature vs. nurture but one of parenting and the lengths that well-intentioned parents go to give them certain advantages in life. I doubt anyone would object raising children with a critical mind, an eye for the arts, and a streak of pacifism. But one of Ben and Catherine’s problems is that they are too focused on results and won’t, or don’t know how to, let their kids be kids. Maybe it’s okay to let them smack each other with a canoe paddle every now and again (so long as it’s on the bum and not malicious) or listen to Iron Maiden on blast or even perform a play inspired by stray issues of Penthouse. Actually, no, that is not okay. 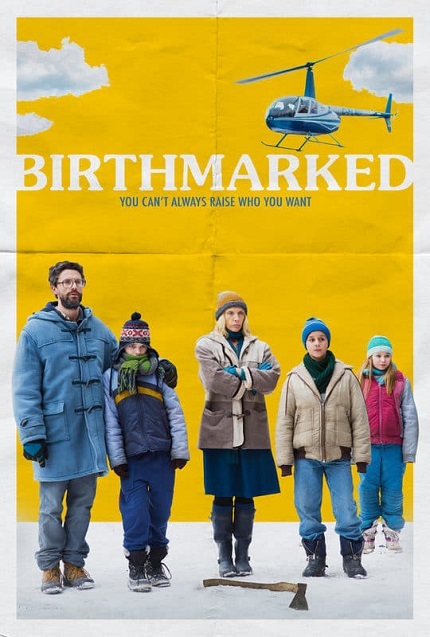 So there is something worth exploring in Birthmarked; the narrative, however, comes out in chunks. Ben seems to be the steady hand, with Goode in a persistent state of bewilderedness, but Catherine is all over the place. She can’t sort out when she wants to play scientist, when she wants to play mom, and when she wants to be both. Even with Collette in the role, it’s hard to feel sympathy for her. The opening voiceover also suggests some unresolved issues between Ben and Catherine and their far more successful parents. I can’t help but think they’re acting on feelings of inadequacy and arrogance and that their own upbringings warped their perception of their children. (So nurture?) None of that gets a mention though. Perhaps if the same attention was paid to developing character as was given to crafting the Wes Anderson vibe, the film might have worked better. It’s also too bad that the children, who are the focus of all this labor, end up void of any personality and are left with only labels to identify themselves. Posted in USA, Western movie reviews and tagged black comedy, comedy, Matthew Goode, Toni Collette on August 31, 2018 by limmer13.